Now, it might seem odd that the fossils of an ocean fish would be found in Kansas since that state is land-locked. However, Kansas wasn’t always land-locked. This state, as well as the entire Midwest, was covered in an ocean called the Western Interior Sea. That is why the Midwest has been such a rich source of marine organisms. 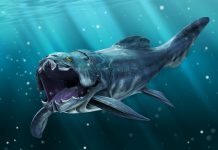 If you look at Xiphactinus pictures, then you might come to the conclusion that you are looking at some sort of piranha. After all, it has a huge mouth that is filled with a lot of razor-sharp teeth. And it probably seemed that way to the fish that it hunted and ate. 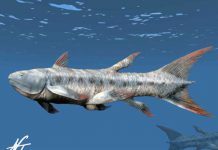 A few of the interesting facts about Xiphactinus include its size and weight. This fish was approximately 20 feet long and weighed around 1,000 pounds. Certainly, not a fish that you would want to run into in the water. After all, it was big enough to eat a human hole. 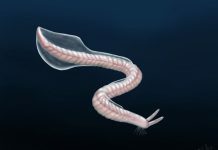 Fortunately, it died out tens of millions of years before humans even walked the Earth. Scientists believe that this fish swam in the waters around what is now North America, Western Europe and Australia. It probably swam the ocean waters in search of prey. Sometimes it would use its razor-sharp teeth to bite into its prey and sometimes it would just swallow it whole – as evidenced by one of the most famous Xiphactinus fossils found. 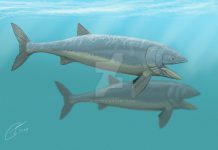 The Xiphactinus fossil in question had the fossilized remains of another fish – a 10 foot long Gillicus – in its stomach. Scientists believe it was still in its stomach because Xiphactinus must have died shortly after swallowing it. This lead to speculation by paleontologists that this fish was swallowed whole and while it was still alive and its thrashing punctured a hole in Xiphactinus’ stomach – thereby causing its inevitable demise.